Today we learned a lot more about the T-Mobile Revvl, T-Mo’s new own-brand Android phone. But that’s not the only own-brand smartphone that T-Mobile has in the works. 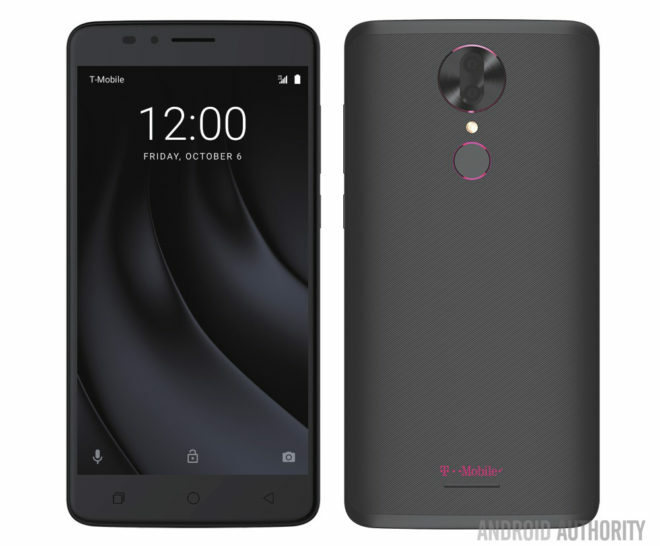 Details on an unannounced device called the T-Mobile Alchemy have surfaced. Images of the Alchemy have been shared by Android Authority, who say that the phone is manufactured by Coolpad. Spec details for the Alchemy are still light, but we can see that it’s got a dual rear camera setup with a fingerprint reader below it, and around front there’s a set of capacitive Android navigation buttons. Also said to be included is a microSD card slot, a microUSB port, and a 3.5mm headphone jack. On the software side, the T-Mobile Alchemy is said to run a stock version of Android, but (unsurprisingly) come with at least one T-Mobile app preinstalled. T-Mobile has offered a few Coolpad smartphones in the past, so it’s certainly possible that T-Mo could team up with Coolpad to release a T-Mobile-branded smartphone. There’s no telling when this Alchemy could launch or how much it’ll cost when it does — though it looks like an affordable handset — but perhaps we’ll learn more soon. I’ll give it a shot IF by chance it’s larger & has more GB than the Revvl. Small chance of that though. Because T-Mobile branded phones have worked out so well in the past… Good way to get a bunch of parents to add lines for their kids I guess, much like the horrendous MyTouch line. The Sidekick was a huge success, but unlike these phones, it was innovative. The Sidekick doesn’t really count. It wasn’t exactly a smartphone in the sense that the pocket PC Windows Mobile devices were but I had my SK2 and loved it. SK3 was a piece of crap so I switched to Sprint and got the PPC-6700 from UTStarcom aka HTC Apache and never looked back. It took a sledgehammer to finally break my SK2. It survived falls from the balcony, a brief drop in the toilet, and many spills at raves and just kept going and the speaker was so loud my grandmother would yell at me every time I left it in my room because you could hear it loud and clear anywhere in the house. It wasn’t just a T-Mobile exclusive, however, known as the Danger Hiptop in other parts of the world so it doesn’t meet the requirements to be branded a T-Mobile device unlike the MyTouch series (minus the MyTouch 3G which was a rebranded HTC Magic) and the Revvl and Alchemy. The G1 is another example that meets your requirements, although the Sidekick was exclusive to T-Mobile in the US. I disagree that it wasn’t a smartphone, though. It was the first device with an app store, used cloud storage (way ahead of it’s time), allowed multitasking, and had push email servers like Blackberry. Some took it as a gimmick because of the form factor, but they were powerful devices. I wish MS never bought Danger and screwed things up. The MyTouch 4g was a brilliant phone for its time. I loved mine. HTC really knocked it out of the park. Mine bootlooped out of the box. Sent it back and got the G2x and had so many problems with that I had to get the Sensation at full price. I wasn’t impressed. I set up the device and it rebooted on me and booted back to the setup screen, set it up again and it worked for about an hour before it rebooted again and it never got back to the setup screen. I’m guessing the eMMC failed. Less than 4 hours out of the box with the first bootloop and reset in about 30 minutes lol. I’m a huge fan of HTC (I bought the U11 on pre-order all the way back in May and I’ve owned many of their Windows Mobile devices along with the Hero, Evo, Inspire, Sensation, One, One M8, 10, and now the U11) but the MyTouch 4G was well known as a problematic phone on XDA. myTouch Slide was kinda nice, especially its Espresso UI. Ported that sucker to my myTouch 3G, and then to my G1 after the Magic got stolen. That’s interesting. I never had problem one with mine aside from getting some dust under the screen. TMO replaced it. I ended up retiring it for the Galaxy S3. LOL. I had a MyTouch 4G when I switched to T-Mobile and every time I would type the letter “i” on the keyboard, it would crash. I switched back to AT&T and got the iPhone 4s. bands support is very weak on t-mobile phones- better off buying unlocked retail. Unfortunately, most idiots go for cosmetic features and ringtones and then complain about coverage and signal. My only wish for these types of phones is that all the preloaded crap can actually be removed normally (no Root or reimaging required). Typically these come with limited storage space for apps to begin with, so if I can remove the 90% of the preloaded stuff I never use then I would be happy. unless t-mobile gets out of the habit of castrating phones, I will NEVER buy from them. T-mobile sold phones typically have only 2 (now band 12 makes it 3) bands of LTE while unlocked phones sold retail have dozens of bands. Because the chipset used is the same (qualcomm made or mediatek), t-mobile tampers with them to make them unusable on other networks which is sinister because now you pay the full price of the phone(s). This is so carrier like and carrier like from a decade ago. Besides, it makes it harder to a) roam domestically if t-mobile strikes new roaming agreements b) makes it harder for t-mobile to HAVE decent roaming partners c) makes international roaming useless for data. STOP doing this, t-mobile when you make customers pay full retail price for phones.